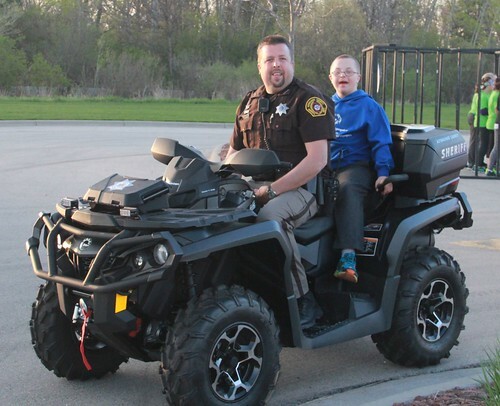 Over 1,600 people across Wisconsin raised $126,841 during Run With the Cops events in 2018! Be part of the fun and fundraising as we crush that amount in 2019. 100% of the funds raised directly benefit Special Olympics Wisconsin athletes. A night run wouldn’t be complete without glow goodies–don’t forget to stop at our glow stations along the course! We’ll deck you out in necklaces, bracelets and blue and red lights! You can also check your speed on the radar trailer as you cross the police tape finish line. Then, relax with coffee and donuts while you snap great selfies in the “jail cell”! Kids can Run with the Cops, too. Set the kids free to compete with uniformed officers in various tasks such as an obstacle course and a kids’ dash. Kiddos will receive badge stickers, glow items, doughnut holes and enough high-fives to make their hands hurt. Civilians vs. Cops–this contest is sure to bring you belly laughs (hopefully not belly aches)! Whether you participate, or cheer on your favorite teams, you’ll enjoy everything from kids and cops challenging each other to a panel of Chiefs and officers facing off for the coveted doughnut trophy. See cops cars, military tanks, a prison bus, tactical vehicles and more up close during this interactive expo. It’s a great time for kids to try on SWAT gear, meet K9 officers, tour a mobile command center and even sit in an armored vehicle. Plus, officers may make you pass a boot camp warm up session before you take off along the 5K route.